The Visual Arts Program at Killara Primary School aims to give students the opportunity to experiment with a variety of ideas, concepts and feelings and encourages them to use their imagination and perception to plan and create artworks. They participate in activities that enable them to take risks and create original and innovative pieces of artwork. Activities are linked to the Integrated Units to support the classroom learning of our students and to draw upon their meaningful experiences and observations. Clearly defined Learning Intentions ensure students are aware of expectations and participate to the best of their ability. ART ROOM NEWS. Term 3, 2014. Term 3 is going to be very exciting. The students will be preparing a showcase of their work for a whole school art show. Each student will have their best piece showcased. There will be a mixture of paintings, prints, collage, textile and clay. The Art Show will help the school celebrate it's 21st birthday. ART ROOM NEWS. Term 2, 2014. We welcome all our students back to an exciting Term 2 of creating, making, exploring and responding to visual arts experiences. Once again activities will be related to class units of work to create relevant and meaningful experiences. We will be following our AusVELS standards and progression points and students will be encouraged to use skills, techniques, processes, media, materials, equipment and technologies in a range of arts forms. They will also identify, describe and discuss characteristics of their own and others’ arts works. We will start the term with all students being involved in discussions about the meaning of Anzac Day and follow-up activities related to this. Prep students will be experiencing printing, painting and construction activities to reinforce the study of their Mini-Beasts unit of work. They will use a variety of skills and techniques to create Leaf Bugs, Finger-Print Caterpillars, Dolly-Peg Butterflies and Paper Flowers. Year 1/2 students will practise and develop paper construction skills and techniques and will make individual display charts of these. They will then use these skills to create a diorama of an Animal Habitat. Students will also create a chameleon using a variety of collage and construction techniques and materials. Year 3/4 students will use clay to develop their construction and modelling skills. They will create pinch, slab and coiled pots and will use tools to make marks and decorate. Their final piece will be an individually chosen storage container to be ‘fired’, painted and decorated. They will also use painting and collage techniques to create a Tryptich Picture of the Earth’s Landscapes. Year 5/6 students will be studying and using the ideas of the artist Van Gogh to inspire them. They will view a copy of his ‘Starry night’ painting and create their own interpretation of this work. They will also use a variety of painting skills, construction techniques and materials to create a Papier Mache Alien and an Earth, Sky, Space Picture. A big thankyou to all those people who brought along items to be used in our art room. Your ‘trash’ is often our ‘treasure’ and we do appreciate this gesture, as it is also another important way of supporting Killara’s Recycling and Sustainability Program. ART ROOM NEWS. Term 1, 2014. All children have settled in very well and are using their creative talents whilst experiencing a variety of artistic media and activities. During the first week of school they decorated their class boxes, which are used to store work that takes more than one session to complete. Activities for all students are related to their units of work to support classroom learning and create meaningful experiences. ‘Learning to Learn’ is a focus for Term 1. 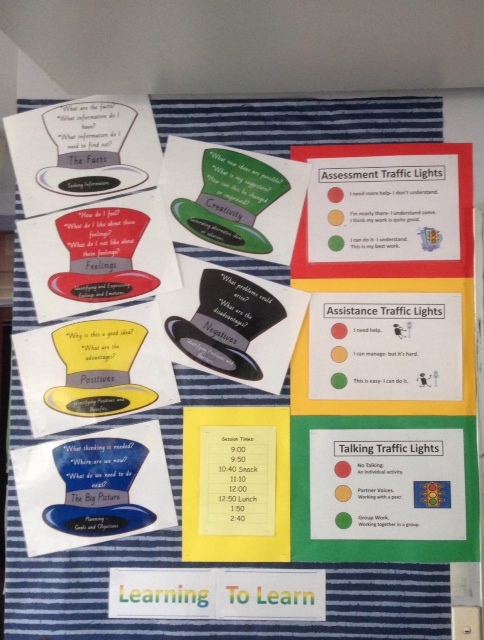 Learning Intentions are discussed and clearly displayed so students are aware of expectations and participate to the best of their ability. Prep students will be involved in discussions about art room procedures regarding safety and use of materials. They will experience a variety of painting techniques and use several different types of media to present their works. Year 1/2 students will be involved in a variety of drawing experiences with a focus on pattern and cool and warm colour tones. They will create name posters, facial feelings pictures and cartoon self-portraits. Year 3/4 students will focus on drawing skills to enable them to create scenery pictures. They will make their own skills chart of different strokes and predict what these strokes could represent in a scenery picture. Year 5/6 students will sketch designs and ideas in preparation for their Term 1 art work. They will use clay to develop their construction and modelling skills and transform one of their designs into a clay piece to be ‘fired’, painted and decorated. EASTER activities will also be incorporated into the art program and students will be assisting to create the Easter Board for Sunbury Square. A big thankyou is extended to those people who have already brought along their ‘donations and treasures’ to be used to assist our art program. We are always in need of cream, dip and ice-cream containers with lids and very much appreciate your efforts.